You’ve heard about Buddha Bowls, but do you know what Dragon Bowls are? 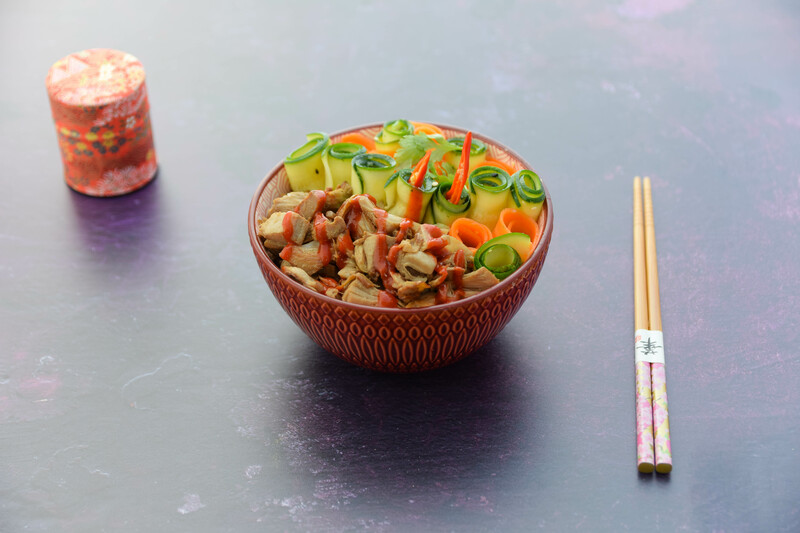 Dragon Bowls are Buddha Bowls’ more exotic, fiery cousin. The secret lies in the sauce, which has a gorgeous meaty, yeasty tang. Not only is this recipe vegan, it is also perfect for Meat-Free-Monday. 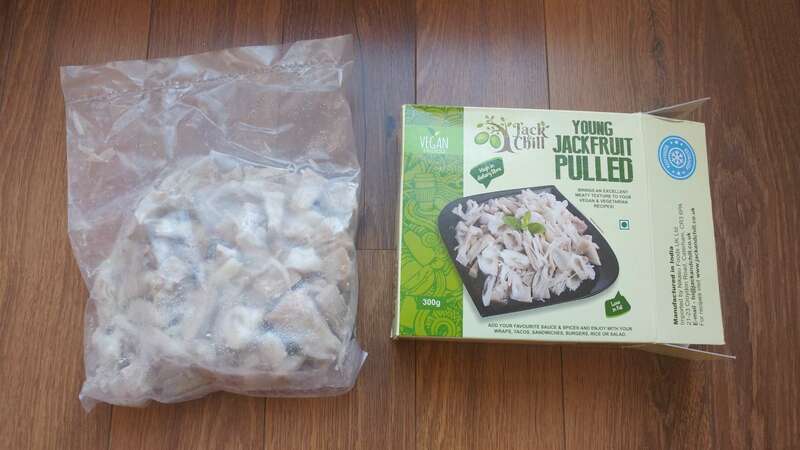 Cooking with Jack & Chill’s frozen jackfruit was a joy; I managed to avoid any messy cleaning and chopping, because it was conveniently packaged. Jack & Chill freeze their jackfruit, taking care to lock in all those luscious nutrients, meaning this dish is healthy and nutritious too. This recipe celebrates vegan food in all its glory, and I really hope you enjoy it too. Regarding availability of ingredients, Jack & Chill, and nutritional yeast are both available from health food shops, the latter creating a heady, potent sauce for the exciting blank canvas of the jackfruit. Make the rice. I pressure-cook rice in my Sage Fast Slow Pro with a rice to liquid ratio of 1:1.25, on a custom setting of 7 minutes. If making rice from scratch, always wash the rice till it runs clear. I find it takes around 7 washes for the water in two cups of rice to run clear. Also soak the rice for a minimum of 30 minutes. Feel free to use pre-cooked packet rice if short on time. Using a vegetable peeler, peel long ribbons of courgette and carrot. 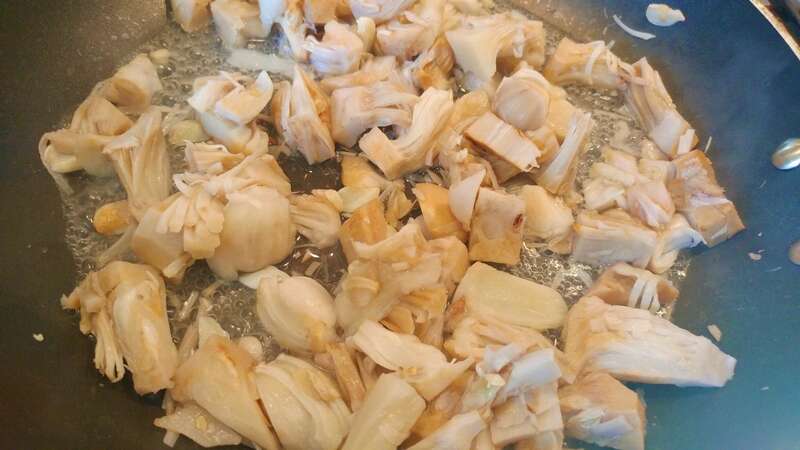 Place in a bowl and mix with the minced garlic and lime juice. Heat a saucepan on a medium heat and toss in the frozen jackfruit. 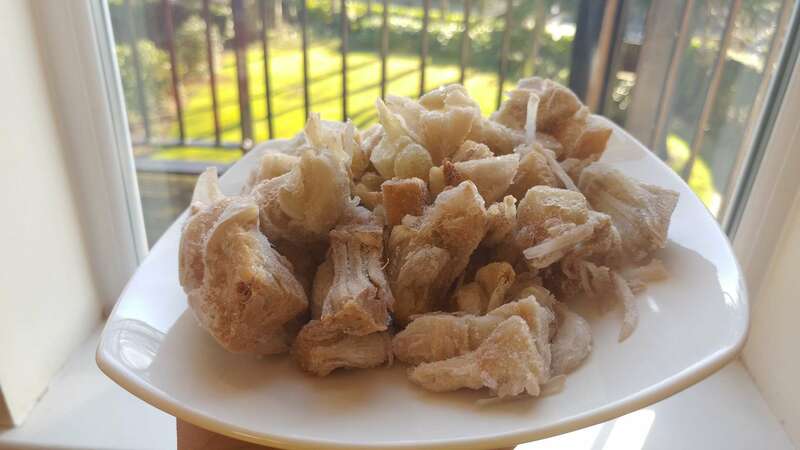 After 4 minutes once the water has evaporated and the jackfruit has fully defrosted, increase the heat to high and add 2 tablespoons oil (the sesame oil plus vegetable oil combination). 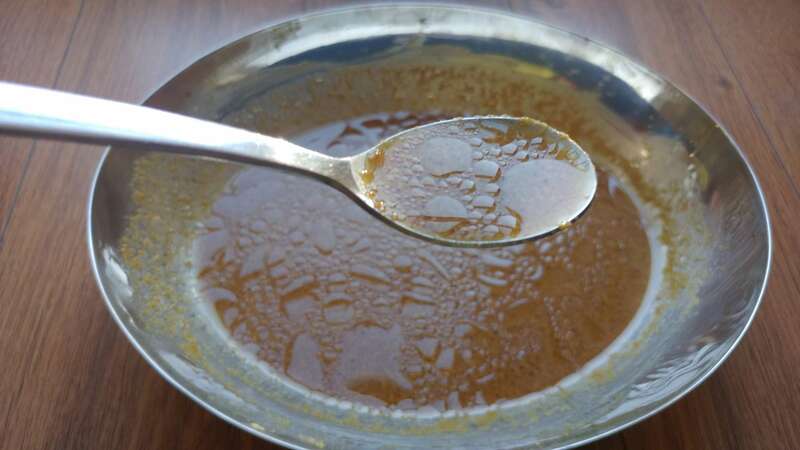 If you add the frozen jackfruit to the oil straightaway, there will be plenty of spattering; this way, you’re evaporating the water and frying in safety. Whilst the jackfruit is getting browned, get the bowl of vegetable ribbons and roll up into rounds. Secure each round with a cocktail stick, so the ribbons will keep their shape without you having to hold them. 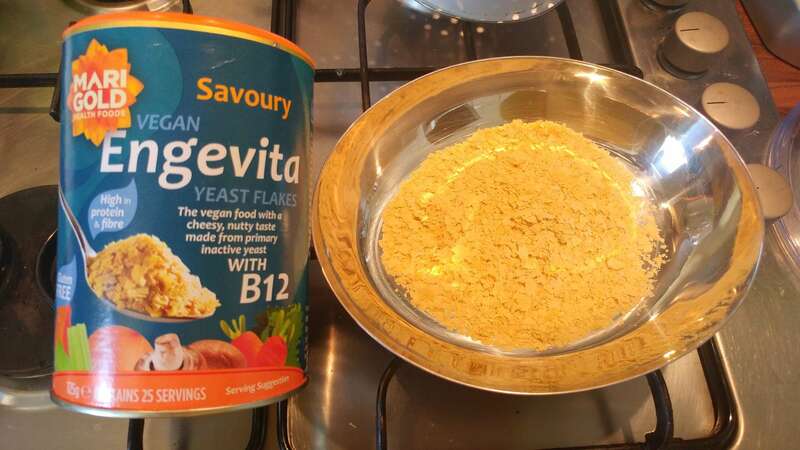 The nutritional yeast I used came in flake form. I added 1 tablespoon of water at a time to ensure the flakes were all dissolved, before adding the rest of the sauce ingredients (soy sauce, garlic powder, vegetable oil, maple syrup, chilli seeds). Whisk everything for around 1 minute till you get a light emulsion. You want the ends of the jackfruit to be slightly browned and need to fry off the jackfruit accordingly. Once you can see brown bits, add the sauce. Keeping the heat on high, continue stirring the jackfruit, which should take on a burnished, brown glaze. Put rice into a deep bowl and gently pat down to form a base. Tumble the jackfruit onto one side of the bowl. Discard the cocktail sticks and nestle the curled ribbons in an attractive cluster in the other half of the bowl. Garnish with a drizzle of Sriracha hot chilli sauce and toasted sesame seeds (toasting is optional but recommended) and coriander sprig. Put a “Do not disturb” sign on your door and pour yourself a nice glass of wine. I recommend a wine pairing of Co-op Vin de Pays Shiraz Rosé, a lovely vegan wine which complements the dragon-sauced jackfruit.